I am walking down the street, arms full of groceries, coming up on three boys shouting angrily at each other. We live near a middle school, and I’ve learned that the kids in my neighborhood either do not view me as an adult or couldn’t be bothered to care if I am. I’ve witnessed a few fights and even tried to break one up to no avail. Not to be Andy Rooney but I don’t understand why I have to break in my old sandals all over again every summer. I don’t have to do this with my boots every fall. Why can’t someone science me up some futuristic foot skin with Tempur-Pedic Memory Foam? It’s 2009 and I realize there’s a depression and some people have the swine flu but my feet are slightly sweaty and sore. I wish I could still play the original Sims game on my Mac now somehow, none of that expansion pack stuff. I don’t need for them to have a dog or a birthday party; I just want to landscape a garden and kill one of them by removing the ladder from the swimming pool. Is this a doable thing, science? Sometimes I hear scraps of background music somewhere that remind me of the music the Sims game would play while you built your house, and I am instantly transported to being 23 years old, laid off and in front of the computer in my first apartment at 3 am. It’s not a bad memory at all. Well! That ended differently than we thought it would, didn’t it. I don’t know about you but I feel refreshed. Comments back on, drinks are on me. The name on the tab is A. Rooney. X: Have you ever been to Unnamed Major U.S. City? O: I try not to set foot in Unnamed Major U.S. City due to a bad ex-boyfriend. X: Ugh, bad exes need to move somewhere mediocre that we never need to visit. Like Lansing. They should all move to Lansing. O: That should be a law. Everyone gets to choose one ex and send them to Lansing. X: We can also send horrible ex-girlfriends of current boyfriends to Lansing. All the exes can get together and spawn weird alien children who have no souls. O: YES. This is brilliant! Any one person can only have one person in Lansing at a time, so if you want to put in an ex’s ex, you have to remove an ex. X: Basically all of us will eventually do our Lansing time, and there will be Lansing marriages, and all the news shows will love it. X: Oh this is great! Poor Lansing will be crawling with terrible people! O: Then, after a few years, Lansing gets to evict the whole colony to whatever city it wants. X: Then the medical mysteries shows will camp out there because Lansing will be filled with deformed babies who have evil intentions. O: And you can’t even pity the babies because their whole purpose in being alive is to make you feel bad about yourself and say hurtful things about your outfit and sneer at you when you try to get close to them. X: Actually, this is pretty close to how I've always suspected that Unnamed Major U.S. City got started in the first place. etsy!, originally uploaded by Sarah Brown. 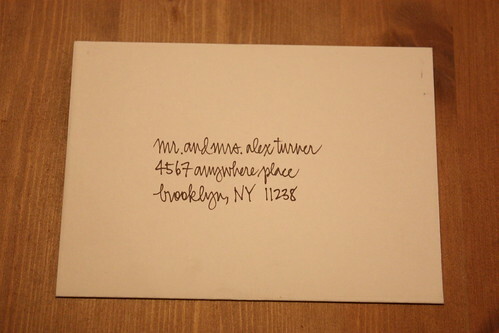 I’ve created an Etsy stop for handwritten envelopes and place cards. Right now I’m just doing my regular pretty handwriting, not actual traditional calligraphy, because calligraphy makes me want to kill myself. But I actually really enjoy writing people’s names in a good pen on pretty paper, so everyone wins this way. You can see the invitations I addressed for Lisa and Todd’s wedding here and here, and the link to my Etsy shop is here. Feel free to pass this along to anyone you know who might be planning a wedding or party or fancy state dinner. I’d love access to some super important ambassador addresses. 1. Eighth grade, January, home with the flu, no doubt missing everything exciting while everyone at school forgets about me. I’m in my bed, pale gray light through the window, sucking cherry zinc lozenges, unable to do anything more strenuous than spend hours looking at my little brother’s Where’s Waldo books until my eyes cross. That Sting song about his father dying and putting a boat in the river is somehow on loop on the radio next to my bed. These all combine to form my idea of a very mild hell. 2. The lemony, oily taste of the wooden arm of the antique chair in the living room after my mother has polished the furniture in preparation for company coming over. I am very small, and obsessed with biting the end of its curled arm. My mother catches me every time and says, “Get that out of your mouth!” Then she puts on the Flight of the Bumblebee album for me to run around the room in circles to until I collapse facedown in the freshly vacuumed carpet, sufficiently exhausted for early bedtime. There are tiny teethmarks on the chair to this day. 3. The only good part about the closing shift at the pool concession stand is that you’re the last one there and you can swim alone after you lock up, which is of course against the rules. My T-shirt and jean shorts are tinged with sweat and hot dog water, and scrubbing the congealed fake cheese from the nacho pot makes me gag every time, but letting the screen door slam behind me and walking outside into the dark to smell the still-sunwarm pool deck sprayed down with bleach makes it all worth it. The bike ride home is uphill and totally silent, no one out to notice I’m in just swimsuit and sneakers. I fall asleep with wet hair waiting to be pulled into a damp, chlorinated ponytail for the opening shift the next morning. Now that my hair is back to normal, we can all breathe a big sigh of relief and get back to work, and for me that means turning in a book in just over a week. So if you’ve been waiting and hemming and hawing about your submission to the UK Cringe book, and I know several of you have because you’ve emailed me, this is your moment. This is the last chance to get it in, or to tell your friends from the UK to send something. I have to say, this one’s received less submissions than the U.S. version, but not one single one yet has been a dud, so I have extrememly high hopes for this book. Submit! Submit often! And then I promise to stop talking about it, at least until it comes out in October.